Gökkuşağı alabalığı (Oncorhynchus mykiss Walbaum, 1792), Kan parametreleri, Lactococcus garvieae. 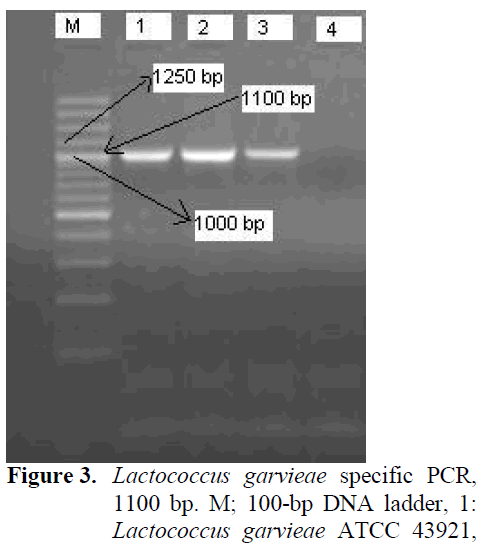 L. garvieae from Lactococcus genus of Strep-tococcaceae, is Gram positive non-motile lactic acid bacteria which produce α- haemolytic colo-nies in blood agar. They are non spore-forming, non-acid fast cocci which are catalase and oxida-se positive (Ravelo et al. 2003; Vendrell et al. 2006). 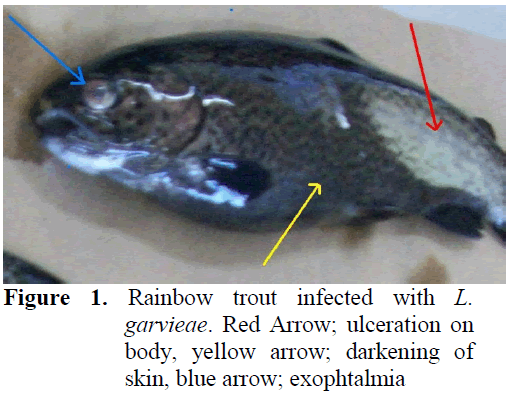 Lactococcosis caused by L. garvieae is an infectious disease of cultured rainbow trout and outbreaks of this disease generally occur during summer months when water temperatures rise above 16°C (Facklam and Eliot, 1995). Non spe-cific symptoms of haemorrhaging and congestion are seen in L. garvieae infections (Kusuda et al. 1991; Domenech et al. 1996) and the others symptoms are immobility, darkeninig of skin and exophtalmia (Collins et al. 1984). 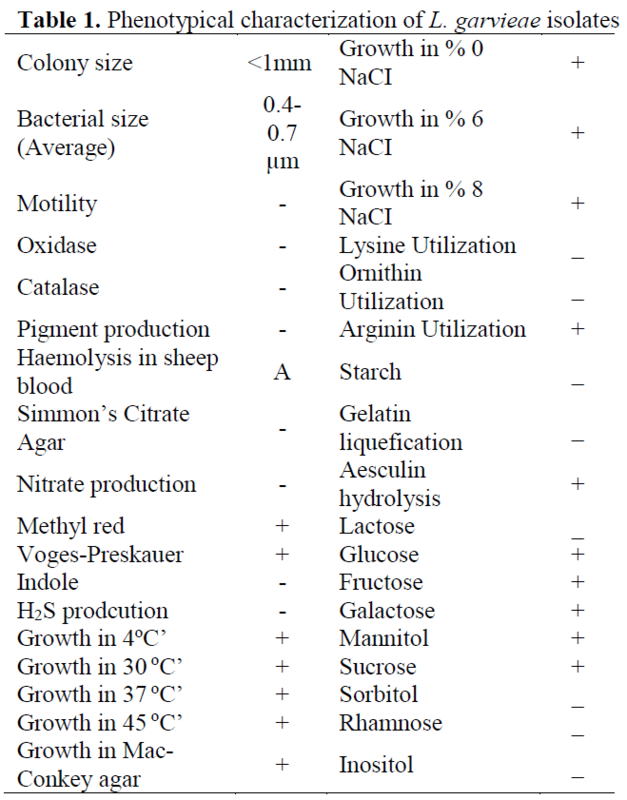 Conventional microbiological methods are of-ten used in L. garvieae identification (Austin and Austin, 2007; Koneman et al. 1997; Timur and Timur, 2003) but identification with these met-hods are inefficient and time consuming (Holt et al. 1994). Polymerase Chain Reaction (PCR) is reported to be an easier and faster identification method for this agent (Zlotkin et al. 1998). Blood parameters of fish are affected by many factors, among which water quality and infecti-ous diseases rank first. They show significant changes in many septicemic bacterial and viral infections such as Motile Aeromonas Septicemia (MAS), Flavobacteriosis, Vibriosis, Infectious Haematopoietic Necrosis (IHN), Infectious Panc-reatic Necrosis (IPN) and Viral Hemorrhagic Septicemia (VHS). These changes in blood pa-rameters is due to losses such as haemorrhagia and the impact of the infectious disease on vital organs such as kidney, spleen, liver and pancreas (Austin and Austin, 2007; Vosyliene, 1996). The aim of this work is to investigate the im-pact of Lactococcosis that naturally ocured in rainbow trout on certain blood parameters. The outbreak was seen in rainbow trout weighing 200-300 g. in a farm located in the Ae-gean region of Turkey in June, 2012. Ten dis-eased (D1-10) and 10 clinically asymptomatic fish (C1-10) were used in this work. For blood sampling, the fish were anesthetized with 2-phenoxyethanol (Sigma) at a concentration of 0.30 ml L-1 and blood from tail fins of diseased and control fish were was drawn asceptically into containers with EDTA. Liver, spleen and kidney samples of fish were inoculated on Trypticase-soy agar (TSA, LABM), Blood Agar (LABM) and incubations in 25°C for 48 hours were carried out. After incuba-tion, colonies were purified and identified according to their physiological, biochemical and enzymatic characteristics (Holt et al. 1994). Isolates were confirmed by PCR (Zlotkin et al. 1998). DNA Extraction was carried out with boiling method (Çiftçi et al. 2009) According to this method colonies grown in TSA were sus-pended in DPEC-treated water (DNase-RNase free) and and was boiled for 10 min. in 100 oC. This was followed by a centrifuge step in 10.000 rpm for 10 minutes. Supernatan was discarded and remains in the tube were used as the template DNA. In PCR amplification pLG-1 (5’-CATAACAATGAGAATCGC-3’) ve pLG-2 (5’-GCACCCTCGCGGGTTG-3’) oligonucleotide primers were used. DEPC-treated water, 1XPCR Buffer, 1.5 Mm MgCl2, 0.2 Mm of each d NTP, 1.0 U Taq polymerase, 1 μM of each primer and 5 μl template DNA was used in the PCR master-mix. The amplification consisted of 35 cycles and the steps were an initial denaturation in 94°C, followed by a 1 min. denaturation in 94°C, 1 min of annealing in 55°C, an extension of 1.5 min. in 72°C and 1.5 min.of final extension in 72°C. As a result, 1100 bp long amplification product was considered to be positive. Amplification products were visualized on a 1.5% agarose gel and 100 bp. DNA marker was used. Positive and negative controls were Lactococcus garvieae ATCC 43921 and Enterecoccus faecalis ATCC 29212, respectively. After aenesthesia, blood from tail fins of dis-eased and control fish were was drawn ascepti-cally into containers with EDTA. Blood samples were analyzed for with a blood count device cali-brated for fish blood (Mindray BC 2800, Tur-key). White Blood Cell, (WBC), Red Blood Cell, (RBC), Haemoglobin (Hb), Platelet Total Value, (PLT), Mean Platelet Volume, (MPV) and Plate-let Distribution Width (PDW) values were re-searched. For the statistical analyses of data; SPSS (for Windows Release 11.5 Standart Versiyon Copy-right © Spss Inc. 1989-2001) was used. With an independant sampling test, data on blood parame-ters in these two groups of fish were compared. The P<0.05 were accepted significant. Clinical symptoms for Lactoccosis in fish were haemorrhages in different parts of the body, darkening of skin and exophtalmia in some (Figure 1). In necropsy, anemia in liver and spleno-megaly was observed. Gram stained slides pre-pared from internal organs of infected fish re-vealed Gram positive bacterial colonization (Figure 2) whereas similiar findings were not ob-served in control group fish. Figure 2: Gram positive cocci in a Gram stained slide prepared from the spleen of an infected fish. Although L. garviae was isolated from all dis-eased fish, no bacterial pathogens were detected in asymptomatic fish. No differences were ob-served in phenotypical characterization of iso-lates and results are summarized (Table 1). Af-terwards, PCR confirmation was carried out (Figure 3). Statistical analyses of WBC, RBC, HGB, PLT, MPV ve PDW values obtained from L. arvieae infected and control fish (Table 2). Table 2: Statistical analyses of certain blood parameters of L. garvieae infected and control group fish. Veterinary haematology is more common in small animal practice; research on blood parame-ters in fish is limited (Dethlof et al. 1999) and analyses are generally carried out manually (Vo-syliene, 1996; Cakıcı and Aydın, 2006; Handy et al. 1999; Zorriehzahra et al. 2010). As fish erythrocytes have nuclei, standard blood count devices record them as leukocytes. Thus, for fast and reliable results with automated devices; the system has to be calibrated with standard (fish) blood. Besides, blood sampling in fish requires special skills as veins are invisible and hard to manipulate. As a result of all these hindrances; determining blood parameters of fish haematolo-gy is harder than other animals. Investigating haematological parameters is an effective way in determining the health status of fish (Blaxhall, 1972; Rehulka, 2002; Martins et al. 2008). Erythrocyte (RBC) count in fish natu-rally infected with L. garvieae was found to be significantly lower than the control group. Simi-lar findings of lower RBC values were also re-ported in coho salmon (Oncorhynchus kisutch) infected with V. anguillarum, in rainbow trout infected with Aeromonas sobria, A. caviae, Aer-omonas/Streptococcus, Y. ruckeri and V. anguil-larum, in tilapia infected with Streptoccus iniae, in carp infected with A. hydrophila and also in Asian chyclid fish (Etroplus suratensis) with epi-zootic ulcerative syndrome (Harbell et al. 1979; Barham et al. 1980; Altun and Diler, 1996; Pathiratne and Rajapakshe, 1998; Rehulka, 2002; Harikrishnan et al. 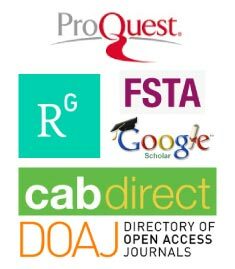 2003; Chen et al. 2004; Ceylan and Altun, 2010). In Nile tilapia experi-mentally infected with Enterococcus sp., RBC values were reported to be unchanged (Martins et al. 2008). Rainbow trout infected with lactococcosis were also found to have lower WBC values (p<0.001). Although in early stages of experi-mentally induced Yersiniosis and Vibriosis, leu-kocyte counts were reported to rise, they were seen to decline as the disease progressed (Altun and Diler, 1996; Ceylan and Altun, 2010). How-ever, Martins et al. (2008), have observed in-creasing WBC values in Nile tilapia experimen-tally infected with Enterococcus sp. Haemoglobin counts were reported to be sig-nificantly lower in rainbow trout infected with Y. ruckeri, Vibrio anguillarum, A. salmonicida, Aeromonas/Streptococcus, in Atlantic salmon with cold water Vibriosis, in coho salmon (On-corhynchus kisutch) with V. anguillarum and in Asian Chyclid fish (Etroplus suratensis) with ep-izootic ulcerative syndrome (Harbell et al. 1979; Barham et al. 1980; Altun and Diler, 1999; Pathiratne and Rajapakshe, 1998; Ceylan and Al-tun, 2010). HGB values obtained in this work were seen to be lower in rainbow trout due to lac-tococcosis (p<0.001). Values for White Blood Cell, (WBC), Red Blood Cell, (RBC), Haemoglobin (Hb), Platelet Total Value, (PLT), Mean Platelet Volume, (MPV) and Platelet Distribution Width (PDW) in rainbow trout naturally infected with Lacto-coccus garviae were found to decrease by Con-trol group (p<0.01, p<0.001). Altun, S., Diler, Ö., (1999). Yersinia ruckeri ile infekte edilmis gökkusagı alabalıklarında (Oncorhynchus mykiss) Hematolojik İncelemeler, Turkish Journal of Veterinary and Animal Sicences, 23: 301-309. Austin, B., Austin, D.A., (2007) Bacterial Fish Pathogens: Disease in Farmed and Wild Fish. 3th ed. (Revised), Praxis Publishing Ltd, Chichester, UK, 457pp. Barham, W.T., Smit, G.L., Schoonbee, H.J., (1980). The haematological assessment of bacterial infection in rainbow trout, Salmo gairdneri Richardson, Journal of Fish Biol-ogy, 17(3): 275-281. Ceylan, M., Altun, S.,(2010). Bibrio anguillarum ile infekte edilmiş gökkusağı alabalıklarında (Oncorhynchus mykiss) Hematolojik İncelemeler, Uludağ University Journal of the Faculty of Veterinary Medicine, 29(2): 35-42. Demirdöğen, N., (1997). Deneysel olarak Aer-omonas salmonicida ile infekte edilen gök-kusagı alabalıklarında (Oncorhynchus mykiss) bazı hematolojik parametreler, Yüksek Lisans Tezi, İstanbul Üniversitesi Fen Bilimleri Enstitüsü, 54s. Facklam, R.R., Eliot, J.A., (1995). Identification, classification, and clinical relevance of cata-lase-negative, Gram-positive cocci, exclud-ing the streptococci and enterococci, Clini-cal Microbiology Reviews, 8: 479-495. Holt, J.G., Krieg, N.R., Sneath, P.H.A., Williams, S.T., (1994). Bergey’s manual of determina-tive bacteriology. 9th ed. Baltimore, Md: The Williams & Wilkins Co, pp. 527–558. Koneman, E.W., Allen, S.D., Janda, W.M., Schreckenber, P.C., Winn, W.C., (1997) Color Atlas of Diagnostic Microbiology, 5th ed., Lippincott- Raven Publishers, Philadel-phia, USA, pp.121-162. Pathiratne, A., Rajapakshe, W., (1998). Hemato-logical changes associated with epizootic ul-cerative syndrome in the Asian cichlid fish, Etroplus suratensis, Asian Fisheries Scien-ce, 11(3-4): 177-316. Timur, G., Timur, M., (2003). Balık hastalıkları. İstanbul Üniversitesi Su Ürünleri Fakültesi Yayınları No: 5, Dilek Ofset Matbaası, İs-tanbul, 538s. Vosyliene, M.Z., (1996). Hematological parame-ters of rainbow trout (Oncorhynchus mykiss) during short-term exposure to copper, Eko-logija/Ehkologiya/Ecology, 3: 12-18. Zorriehzahra, M.J., Hassan, M.D., Gholizadeh, M., Saidi, A.A., (2010). Study of some he-matological and biochemical parameters of rainbow trout (Oncorhynchus mykiss) fry in western part of Mazandaran province, Ira-nian Journal of Fisheries Sciences, 9(1): 185-198.